With a few days of clear skies and warmer temperatures (up to 45 degrees F), the snow is in full retreat. Each day, new tundra hummocks and ponds appear from beneath the winter snow pack. The birds are taking full advantage of the emerging habitat, frantically feeding and displaying to make up for lost time. So far only the American Golden Plovers have started nesting. Snow covered the landscape when we first arrived. 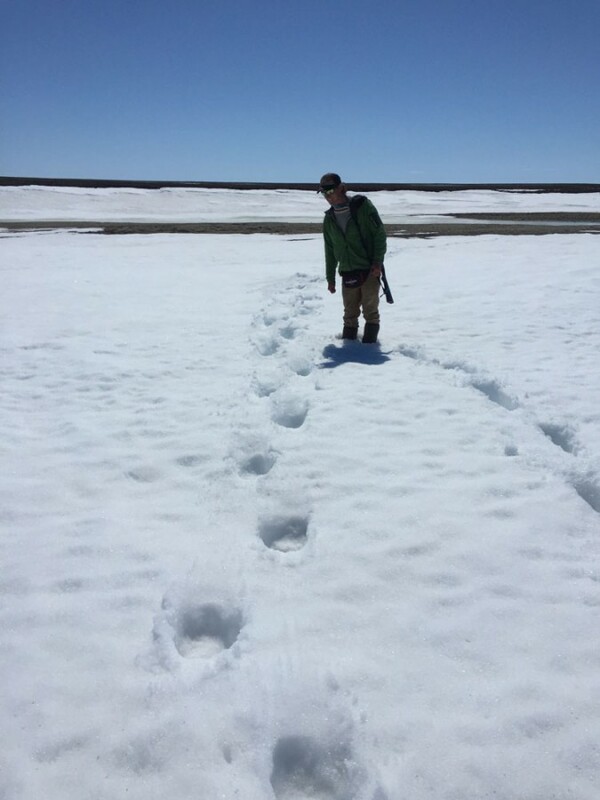 Many low-lying nesting areas are still covered in deep snow on June 18. Their habitat, gravel ridges, has been snow-free for several days longer than the lower sedge tundra. The Semipalmated Sandpipers are back in good numbers this year. In 2014, only two of our tagged birds returned to the study area. This year we have seen nine tagged Sandpipers and have already recaptured four of them! Normally we capture the birds on the nest using a soft bow net. With the delayed start to the season and the number of Jaegers and Peregrines around, I decided to try for some early recaptures. The late snow and cold mornings create a difficult environment for early arriving shorebirds. 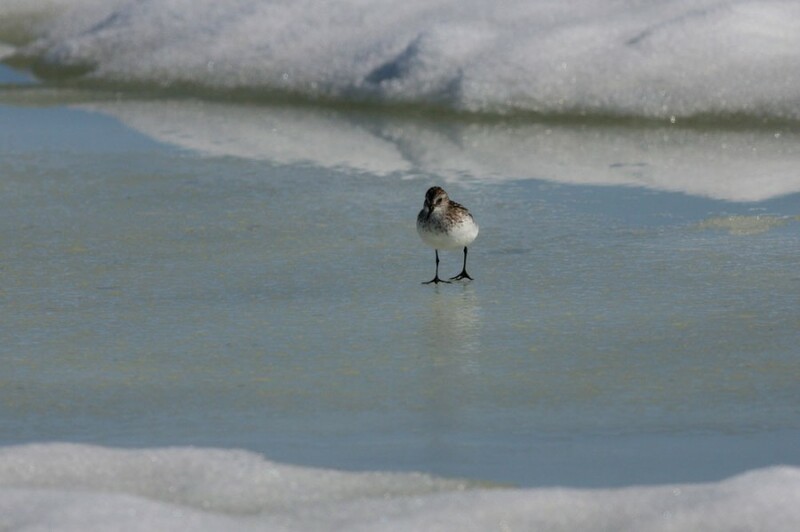 This Semipalmated Sandpiper searches for food in the frozen landscape. Taking advantage of the aggressive territoriality of the male Semipalmated Sandpipers, I set up the bow net on a high mound inside a tagged bird’s territory and play a display call from a speaker under the net. This method does not work every time, but when it does work it usually happens quickly. 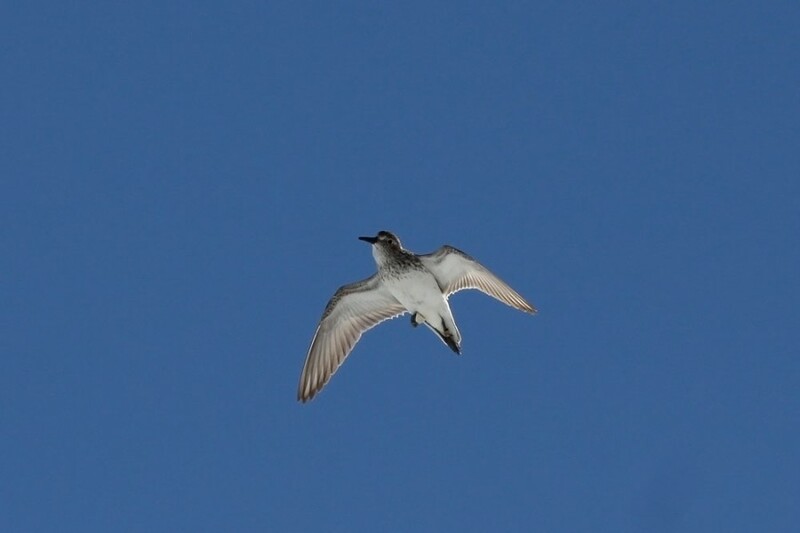 A Semipalmated Sandpiper with a geolocator tag displays over his territory. Once I have the bird in hand, I remove the geolocator flag and old color bands and replace them with the standard color band combination for Coats Island (white flag band over orange band). Each bird gets a set of measurements to assess health and then is quickly released. Several tagged female sandpipers have returned as well, but I will likely have to wait to recapture them until they are on nests because they do not respond to the playback call. 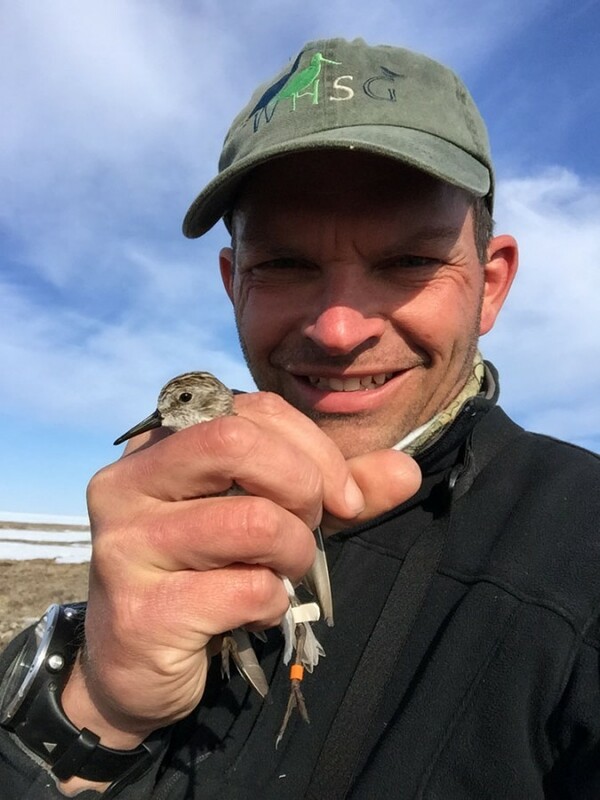 Shiloh Schulte holds a Semipalmated Sandpiper tagged with a geolocator. We have already recaptured four tagged birds. The flight paths recovered from these tags should help fill in the picture of the migration routes, wintering areas, and stopover sites for Semipalmated Sandpipers nesting in Eastern Canada. Despite the extensive snow cover on the island, the ice pack in Hudson Bay is lower than ever this year. In fact, it is possible that the increased snow on the island is a result of the warmer weather and additional open water this past winter. Normally this area is frozen in and does not get very much snow or rain during the year. 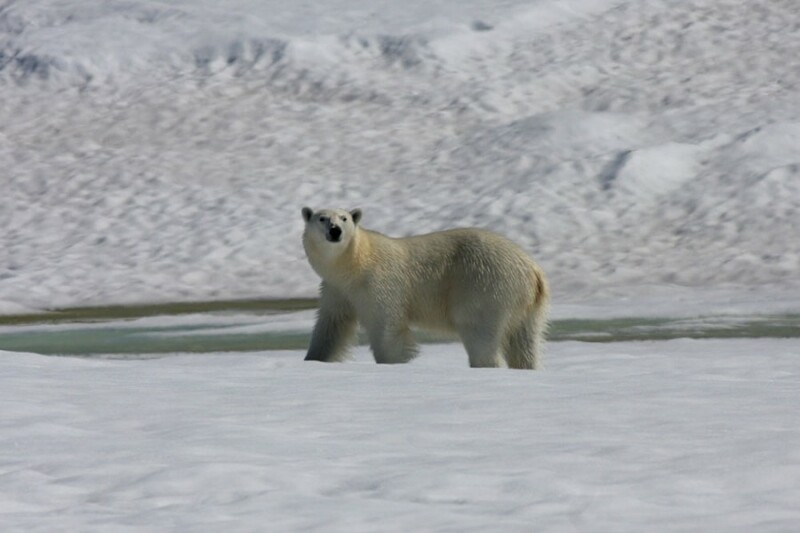 As a result of the reduced ice, we expected more Polar Bear encounters. Typically, the bears remain on the ice pack hunting seals as long as possible, usually until late July or August. When the ice breaks up they are forced to come on land in search of food. A Polar Bear following the river across the island notices our camp. We had our first bear encounter on June 14 this year. This bear was crossing the island from the South, heading toward the remaining ice on the North end of the island. 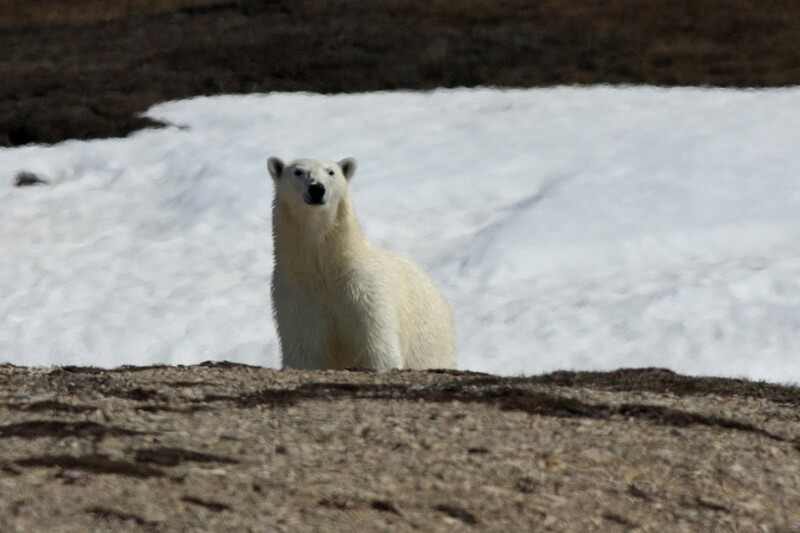 Lindy Spirak, a new field tech working on the Environment Canada/Trent University project, spotted the Polar Bear when it was still well up the river. The bear worked its way down the river until it smelled our camp and decided to investigate. Curious but not aggressive, the bear turned and ran as soon as we fired a couple of warning cracker shells. We are keeping a sharp eye out, but have not spotted any more bears this week. This Polar Bear was very interested in our camp. Seconds after this photo was taken, we scared the bear off with a few cracker shells (loud firecrackers fired into the air from a shotgun). The bear continued on toward the remaining sea ice on the North end of the island. Scott Flemming checking out the Polar Bear tracks after the bear continued on down the river. Now that the ponds are opening up, the waterfowl have started moving in. 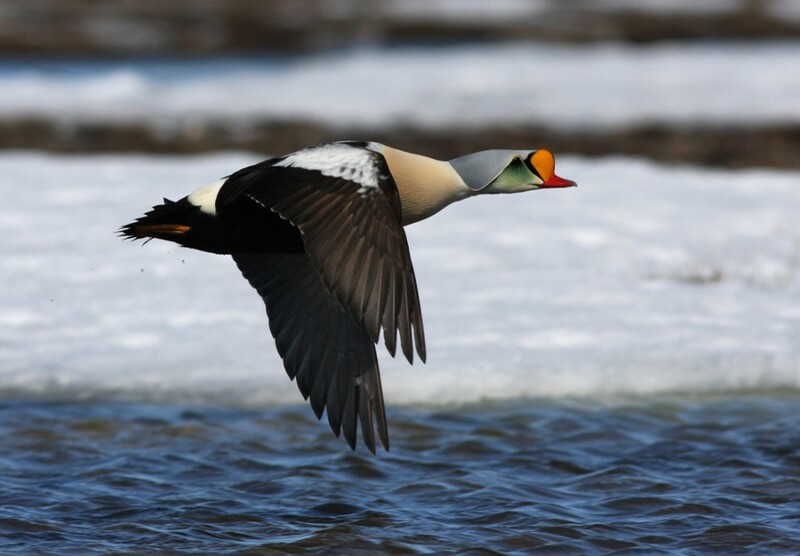 A small flotilla of King Eider are back on the ponds near camp, along with Northern Pintail and Long-tailed Ducks. Pairs of Cackling Geese dot the landscape, occasionally dwarfed by flocks of their larger cousins, Canada Geese. Flocks of Snow Geese pass overhead, though we do not have any nesting near our camp. A male King Eider in full pursuit of a female. King Eider males stick close to their mates until egg laying is complete. At that point they return to the open ocean, leaving the camouflaged females to incubate the eggs and raise the young. 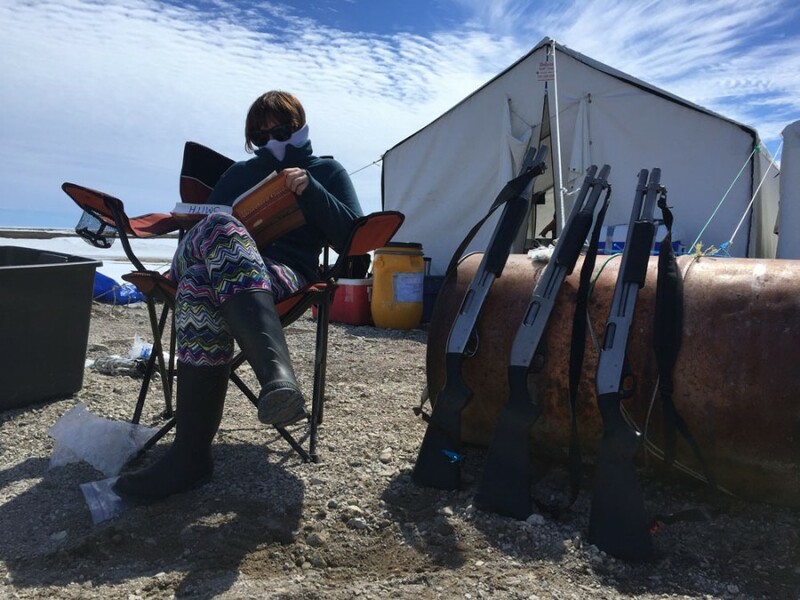 Lindy Spirak reads up on shorebird identification and ecology on a sunny evening in camp. 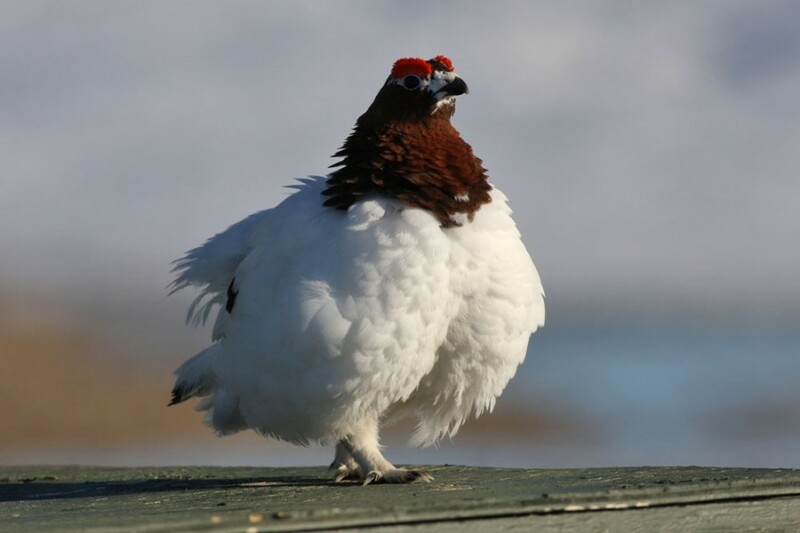 Willow Ptarmigan are abundant on the study plots this year, a difference from previous years. Our local bird (named Ptodd) thinks the cabin makes a great display platform and loves calling loudly from the roof as the sun rises around 2 am. Parasitic Jaegers are sweeping the tundra again, searching for waterfowl and shorebird nests. We have only had one Arctic Fox sighting so far, but it coincided with finding our first shorebird nest. We will likely see more foxes as nests start to dot the landscape. Ptodd the Ptarmigan strutting on the cabin roof. Ptodd likes to call loudly from the rooftop at sunrise (2 am in the arctic). This study is a cooperative project with Environment and Climate Change Canada (http://www.ec.gc.ca/). In addition to collaborating on study design and analysis, Environment and Climate Change Canada managed many of the logistics, including transport, and lodging. Funding and support for Manomet’s 2016 field season on Coats Island was provided by the Commission for Environmental Cooperation (http://www.cec.org/). The CEC is an intergovernmental organization dedicated to addressing environmental issues of concern across North America. So exciting! Go Shiloh! And you made me laugh out loud at Ptodd! There aren’t enough exclamation points in this comment. Great post, Shiloh! Keep up the good work!! Another great read. Keep ‘em coming! Lorien and Caelyn enjoyed the photos and stories, as did I.